The first United Nations relief flights landed in Burma on Thursday, while American military planes stocked with aid waited for clearance to land in the flood-ravaged country. People left homeless by last weekend's devastating cyclone take shelter in a monastery in Kaw Hmu village on Thursday. ((Associated Press))The first United Nations and Red Cross relief flights landed in Burma on Thursday, while American military planes stocked with aid waited for clearance to land in the flood-ravaged country. U.S. Secretary of Defence Robert Gates said the Burmese government has so far been denying Americans access. Still, he said he would not consider overstepping Burmese authority by air dropping aid packages into the country, a proposal floated earlier by the U.S. Office of Foreign Disaster Assistance. "I cannot imagine us going in without the permission of the [Burmese] government," he said Thursday. The U.S. military has three planes, as well as humanitarian supplies and equipment, in place in Thailand ready to fly into Burma and help the survivors of Saturday's cyclone, which may have killed more than 100,000 people. A fourth U.S. flight stocked with aid cargo is en route to the area, the Pentagon has said. The U.S. navy also has three ships in the Gulf of Thailand ready to help with relief efforts, including an amphibious assault ship with 23 helicopters aboard. Burma's refusal to let U.S. military in comes after years of strained relations between the two countries. The U.S. has imposed a variety of economic and trade sanctions on Burma in protest of the policies of the country's military junta government. During Thursday's question period in Ottawa, Foreign Affairs Minister Maxime Bernier said the Canadian government has offered to send Canada's Disaster Assistance Response Team, also known as DART, but it was not clear whether it would be allowed into Burma. "I’m hoping that working with the UN will convince the oppressive regime to let them in," Bernier told the House of Commons. The UN and other agencies have gotten some access to the southeast Asian country but only after long battles with Burmese officials to get visas cleared for international aid workers. Two UN flights loaded with items including high-energy biscuits and medical kits landed in the country Thursday, a UN official said, speaking on condition of anonymity. The official said two more flights were expected to touch down in Burma, also known as Myanmar, later in the day. The International Red Cross said its first planeload of supplies, including shelter kits, has arrived, with a plane carrying jerry cans and tarpaulins expected to land Friday, according to Michael Annear, the agency's disaster management co-ordinator in the region. "It is enough of a challenge that visas are being held up for bringing in experienced international relief workers, but it is specially frustrating that critically needed food aid is being held up," a spokesman for the UN's World Food Program, Paul Risley, said earlier Thursday. Cyclone Nargis killed at least 22,980 people, according to the latest death toll published by state media Thursday, while more than 42,119 people are missing. But U.S. officials have pegged the death toll at 100,000, with the UN estimating that about 1 million people were rendered homeless by the storm. Villages in the Irrawaddy Delta, one of worst hit areas, remained submerged Thursday while bloated corpses bobbed inside the coastal mangroves, according to reports. An estimated 95 per cent of buildings have been destroyed in the area. 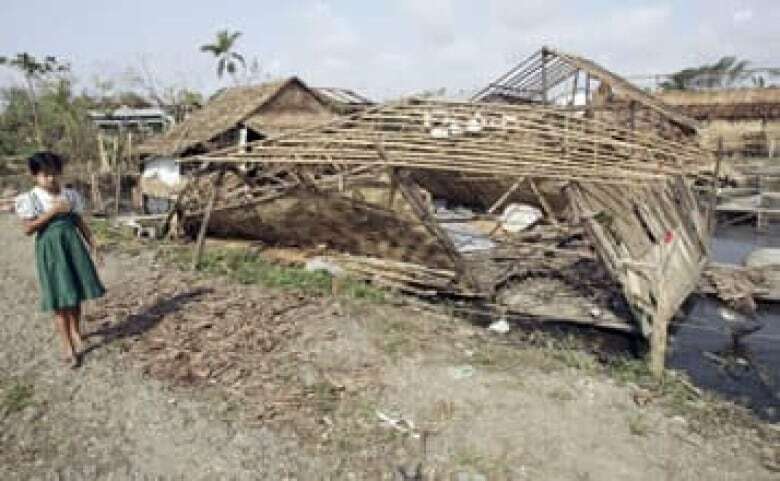 At least 40 per cent of people killed by the cyclone and its aftermath were children, Andrew Kirkwood, an official with Save the Children, told CBC News. UN officials have warned that delays in issuing visas to relief workers are hampering aid efforts, and that the country could face an even worse humanitarian crisis and higher death toll if vital supplies, including food and water-purification tablets, are not provided quickly to survivors. Between 30 and 40 visas requested by the UN and other aid organization are still sitting with the Burmese government, UN spokesman Richard Horsey said in Bangkok. "These are mostly people who have key experience in handling disasters of this scale, and so they can bring lessons from other similar disasters," he said. "The agencies are becoming frustrated." Relief teams and aid material are waiting to be brought in from Thailand, Singapore, Italy, France, Sweden, Britain, South Korea, Australia, Israel, U.S., Poland and Japan, according to minutes from a UN relief meeting in Geneva that were obtained by the Associated Press. The Association of Southeast Nations is urging the international community to continue shipping aid to Thailand despite the delays. "Please keep the help coming, keep the contributions coming, and if you have to, go to Thailand, park there and wait for redistribution from there," ASEAN secretary-general Surin Pitsuwan said Thursday. However, some organizations have refused to simply drop the supplies into the waiting hands of the military junta, who have ruled the country since 1962. "We will not just bring our supplies to an airport, dump it and take off," WFP's regional director Anthony Banbury told AP Television News. "This is one reason why there is a holdup now, because we are going to bring in not just supplies but a lot of capacity to go with them to make sure the supplies get to the people." 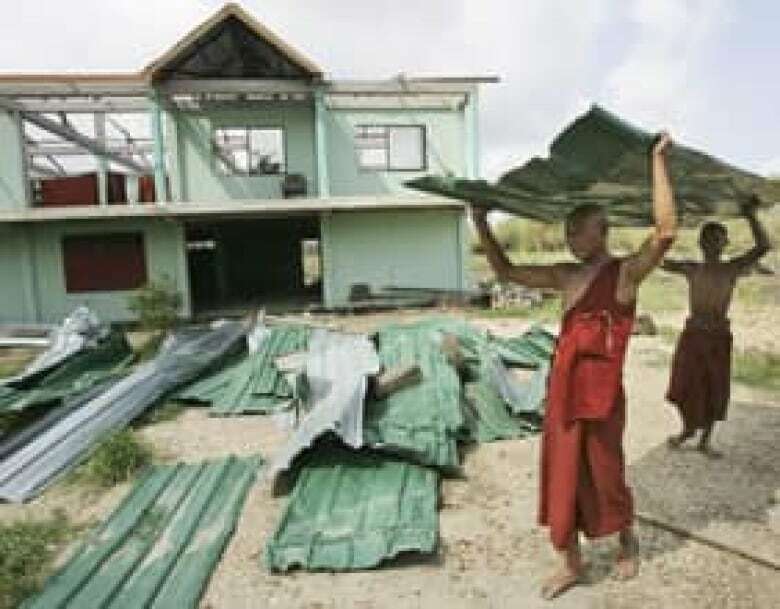 Some villagers around the city of Rangoon complained that they were depending on Buddhist monasteries to provide relief. "The government is not helping us. No aid is coming. 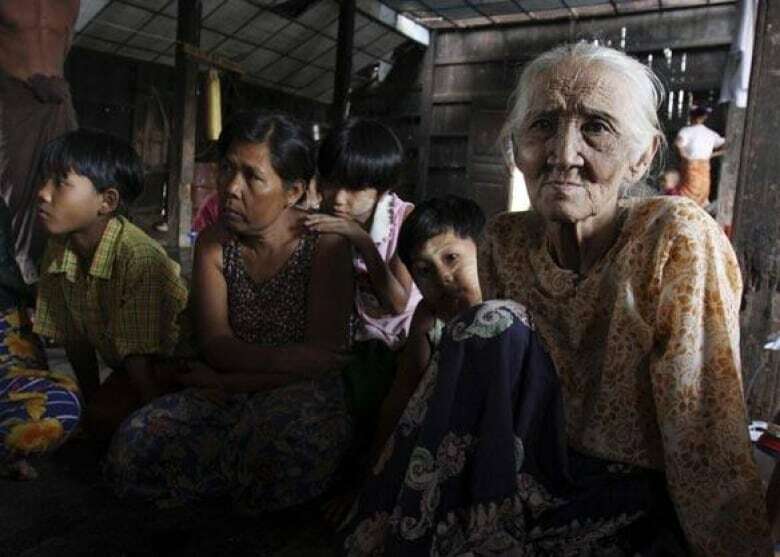 There is no money, no rice," said Mu Sanda, one of about 50 people huddled in a monastery dining room that has been converted into an evacuation centre in Kyauktan, 25 kilometres southeast of Rangoon. Burma has accepted aid from traditional allies such as India and China, which stepped forward Thursday to urge the junta to accept assistance from other countries. "We hope Myanmar will co-operate with the international community, will have consultation with the international community, and we hope Myanmar will overcome the disaster at an early date," said Chinese Foreign Ministry spokesman Qin Gang. More than 700 tonnes of food aid has already arrived in the city of Rangoon. Indian navy vessels and planes from Japan, Thailand, Singapore and Laos and Bangladesh have delivered medicine, candles, instant noodles, raincoats and other relief supplies, according to Burmese state television. China is pledging to send $4.3 million US in aid in addition to its initial pledge of $1 million US. Britain has offered about $9.8 million to help the crisis, and the U.S. offered more than $3 million in aid, while Canada has pledged $2 million.